Expedia (NASDAQ: EXPE) has delivered a strong performance so far this year, driven by robust gross bookings from both HomeAway and Egencia. In the first nine months of 2018, the company’s revenues grew 12% year-over-year (y-o-y) to $8.7 billion, driven by a 13% y-o-y growth in overall gross bookings. The top-line growth was also driven by significant growth across night rooms booked and increased air ticket revenues. In addition, Expedia’s adjusted EBITDA grew 14% during this period, largely due to the company’s efforts to optimize its direct marketing spend. Going forward, we expect the company to continue this top-line growth momentum, though its hiring and automation costs could put pressure on its bottom line. Going forward, we expect Expedia’s revenue to increase by about 20% from fiscal 2017 through fiscal 2019. To arrive at our fiscal 2019 net revenue estimates for the company, we have broken down the revenue streams and estimated separately. 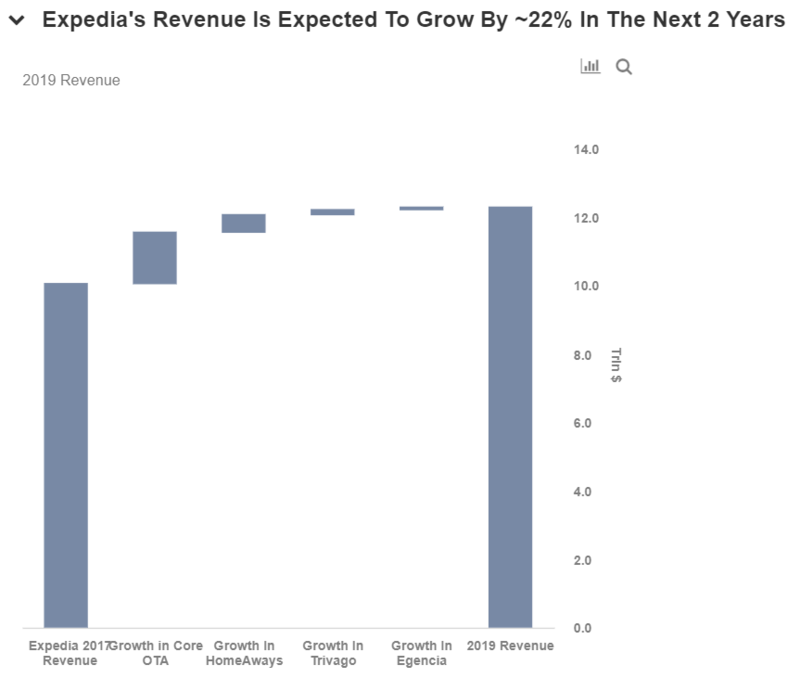 We have also created an interactive dashboard on What Will Drive Expedia’s Near-Term Growth? which provides a detailed analysis of how to arrive at this growth number. You can make changes to these variables to arrive at your own revenue estimates for the company. Expedia’s stock is slightly down year-to-date despite strong financial results, largely due to its long-term growth concerns. We have maintained our long-term price estimate for Expedia at $123, which is slightly ahead of the current market price. Looking at fiscal 2019, we expect Expedia to generate around $12.2 billion in revenues and adjusted earnings of around $460 million. 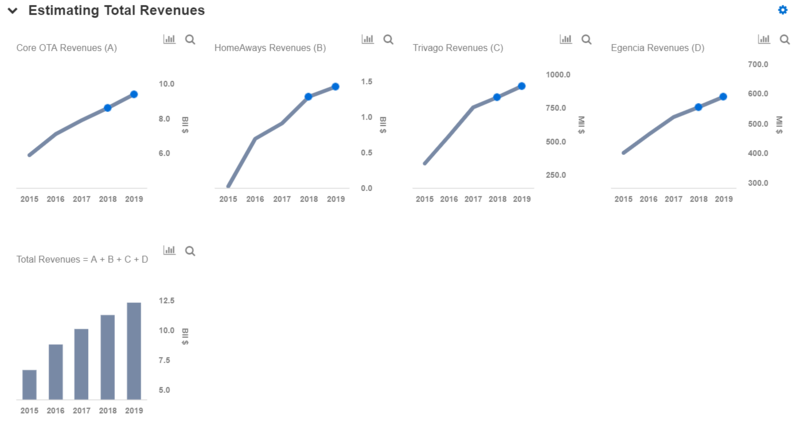 Of the total expected revenues in 2018, we forecast $9.3 billion in revenues for the core OTA business, nearly $1.4 billion for the HomeAway business, over $900 million for Trivago, and nearly $600 million for Egencia. We estimate a take rate of around 11% for 2019, which is similar to the figure for the past few years. This, combined with a gross booking forecast of $84.7 billion, should help generate OTA revenue of $9.3 billion in 2018. Expedia has managed to drive growth through a series of acquisitions. Recently, it acquired Pillow and ApartmentJet, with a focus to deploy its capital strategically to enhance shareholder returns. This is expected to add a unique software platform which will lay the foundation for HomeAway and Expedia Group’s urban expansion efforts in the coming years. The company is also aggressively investing to migrate to cloud computing systems to cut costs and improve marketing to better compete with rivals such as Booking Holdings (NASDAQ: BKNG). However, the company has lowered its expectations for spending on the cloud to about $150 million in 2018 from its earlier forecast of just below $170 million. That said, management also emphasized that the cloud expenses could exceed $250 million in 2019. Further, the company aims to double its gross bookings by the end of this year by leveraging its data-driven approach to marketing optimization, while continuing to aggressively drive its global expansion plans. We expect this to drive the company’s value in the near term.